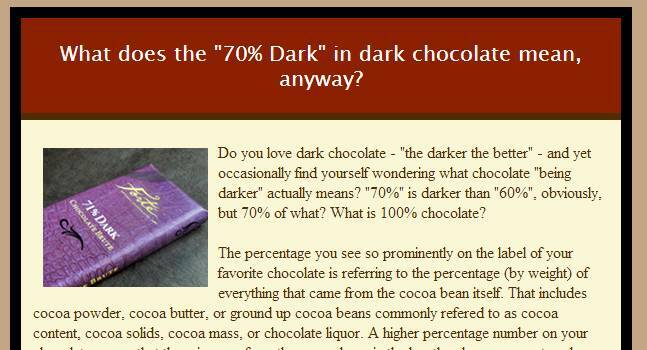 Ever wonder what makes dark chocolate dark? For the scoop check out this article by Forte Chocolates in Mt Vernon WA. Karen makes understanding the % on your chocolate simple and easy. I still don't advocate choosing chocolate based only on percentage, once you let go of the perception that all dark chocolate is bitter you'll find many more chocolate bars where diverse flavors delight the palette. Chocolopolis welcomes Bryan Graham, Founder and Chocolate Maker of Fruition Chocolate, who is visiting Seattle from Shokan, NY. Bryan was a child pastry prodigy, beginning his career as a pastry chef at age 16. He attended the Culinary Institute of America in Hyde Park, NY, where he first made chocolate from the bean with famed pastry chef Peter Greweling. He fell in love with the story of cacao and chocolate, and he founded Fruition in 2011. Meet Bryan and his wife, Dahlia, and taste their Peru single-origin bars at this week's happy hour. Sunday June 23 Chocolate Rendezvous coming up on Sunday June 23 in Seattle. Stay tuned for details.